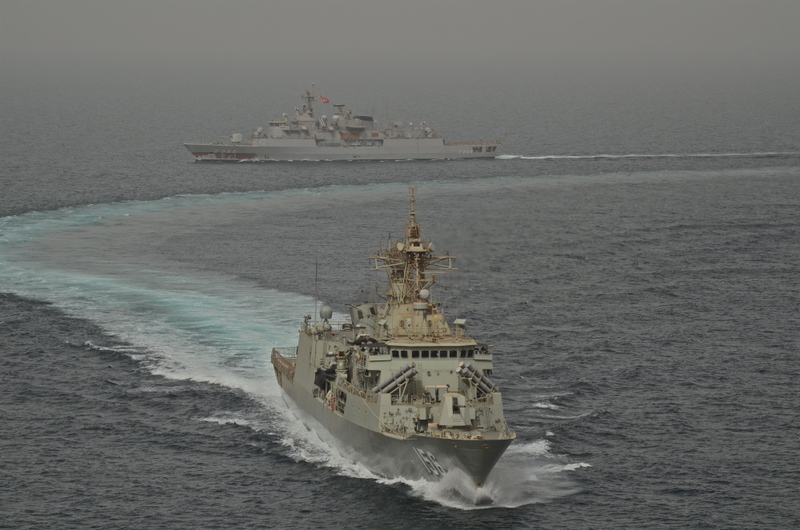 HMAS Toowoomba contributed to maritime security in the Bab El Mandeb Strait through participation in a multi-national exercise, Exercise SCIMITAR EXOCET, under the command of the French-led Combined Task Force 150. Exercise SCIMITAR EXOCET was conducted July 22 – 23,in the vicinity of the Gulf of Aden and in addition to Toowoomba, two Turkish Navy vessels and French Mirage fighter aircraft participated. 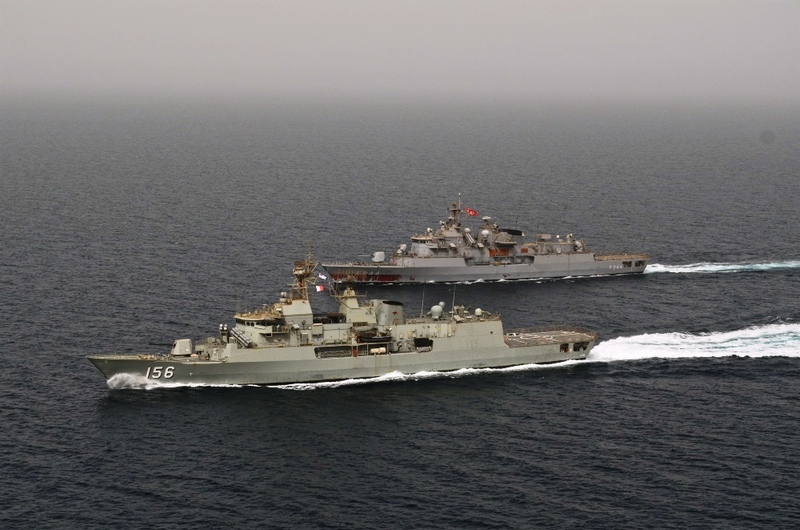 Toowoomba’s Commanding Officer, Commander Andrew Quinn, said the exercise proved the interoperability of Combined Maritime Forces’ (CMF) in responding to a range of potential threats, including air attacks, in the narrow strait that is the only means of access for 23,000 merchant vessels annually from the Red Sea into the Gulf of Aden. “The exercise demonstrated the Combined Maritime Forces’ resolve to maintain safe and unfettered access for shipping through a vital international strait,” Quinn said. A real demonstration of why such exercises are so valuable came just hours before the SCIMITAR EXOCET began, with Toowoomba receiving a distress call from a merchant vessel stating that it was under attack by suspected pirates. Toowoomba’s Seahawk helicopter was quickly launched to provide assistance, which thankfully was not required on this occasion as the suspected pirates subsequently broke off from their attack and fled. “This was a timely reminder for my crew about the volatile nature of the region within which we are presently operating and also the value of the training we regularly undertake to hone our skills for operations.” Quinn added. On July 23, Toowoomba was also afforded a very rare opportunity for an Australian warship when she engaged in advanced air warfare exercises with French Mirage fighter aircraft supporting SCIMITAR EXOCET. “My air warfare team did a great job taking charge of this aspect of the exercise, grabbing the opportunity to showcase their skills and our ship’s capabilities.” Quinn said. HMAS Toowoomba is presently deployed in the Middle East Area of Operations, operating as part of CMF’s Combined Task Force 150. “The Middle East can be a very demanding environment in which to operate, but the Toowoomba team has risen to every challenge in a professional and committed fashion, maintaining Australia’s highly respected position as a coalition partner.” Quinn concluded. CTF 150’s mission is to promote maritime security in order to counter terrorist acts and related illegal activities, which terrorists use to fund or conceal their movements. CTF 150‘s Area of Operations (AOO) spans over two million square miles, covering the Red Sea, Gulf of Aden, Indian Ocean and Gulf of Oman.